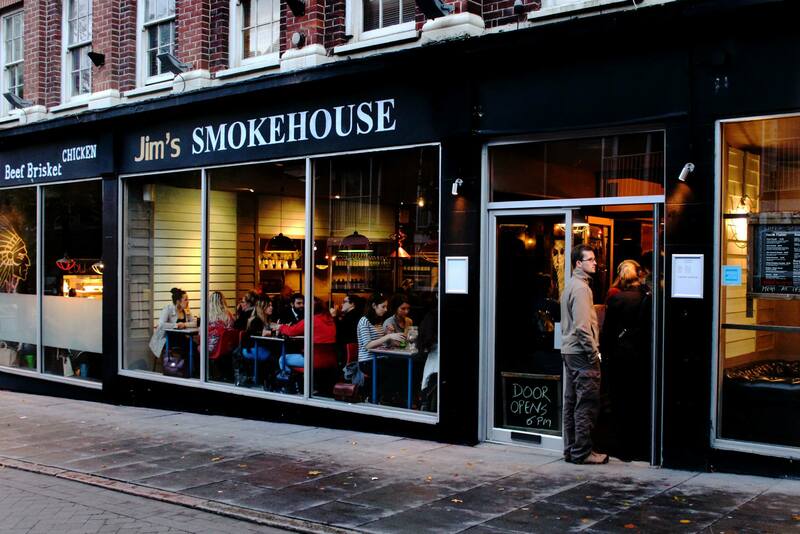 Following the relative successes and failures of Red Hot Buffet and Rakonto, Jim’s Smokehouse has pitched up in the unit toward the bottom of Hockley. An effective Twitter onslaught ensued with a couple of launch nights and free meals as a marketing gambit. I did make a very early visit at the launch but thought I would give a couple of weeks for the dust to settle. You enter facing a bar but this isn’t somewhere you may come just for a drink, a couple of sofas are stuck awkwardly in the corner, but Jim’s is a restaurant first and foremost. Seating is a mixed bag with high plastic chairs at metal tables in one section and a more comfortable wooden themed dining area closer to the kitchen. The menu is short and majoring on what you’d expect of a smokehouse. Man vs Food comments have inevitably been made and if you’re a vegetarian I give you permission to stop reading now. I hope you will forgive me for not sampling any starters. You can get calamari, nachos and some smaller portions of what’s amongst the mains but Jim’s feels like the place where you get one big plate of food. And that’s exactly what I did. 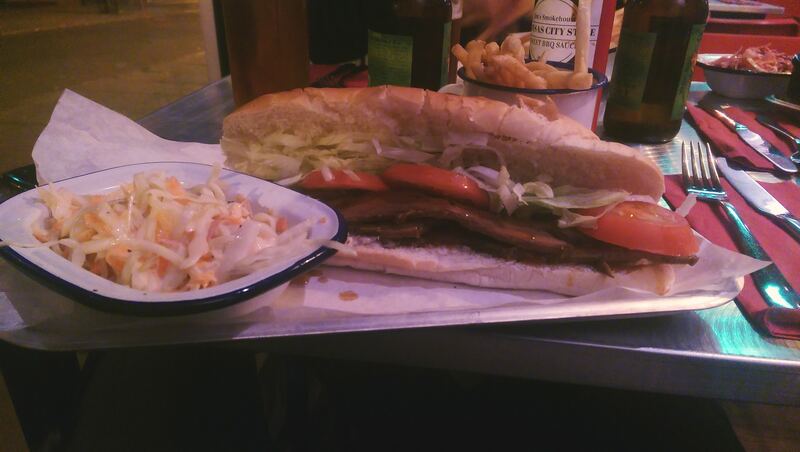 £8.95 got me a brisket hoagie, a long soft roll (cob, if you insist) a cup of fries and coleslaw. The roll was pretty sizeable and it contained some pretty standard salad as well as the brisket. The beef itself had enough about it to carry through the carbs, deep flavour having worked its way up through the slow cooking. Fries were pretty decent, thin and crispy, an improvement on the average fat chips they had when I first visited. Coleslaws were disappointing; one was a pretty average cabbage, carrot and mayo number. The second was worse, a slaw of red cabbage and carrot with nothing to bind it all together and no added dimension. Friends shared the grand feast at £16 each for a platter including, ribs, pulled pork, BBQed chicken and more brisket. Ribs were a great deal better than the launch, the meat falling of the bone nicely. The main disappointment was one of the pieces of chicken that was noticeably dry. Generally the feeling on both visits that things were well smoked but we wanted a bit more BBQ. 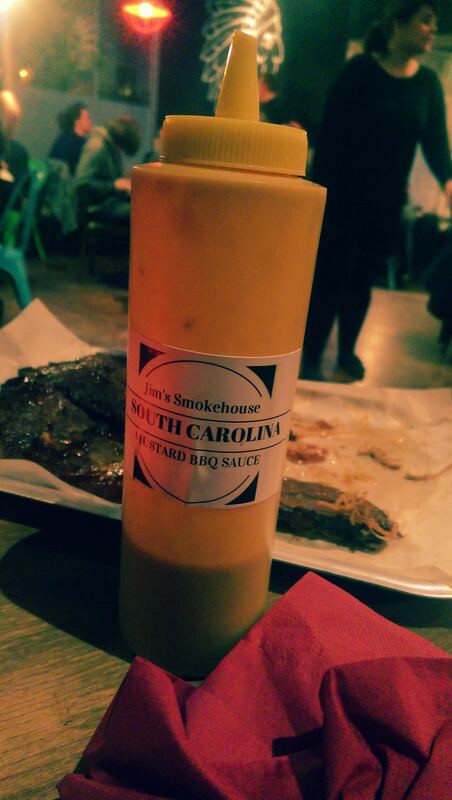 Maybe we have an idea here that things should be covered in too much sauce whereas true BBQ is more about the smoke than the sauce. Another issue they have with lots of this meat on an open metal tray is that half way through everything is cold, something they need to try and overcome. The real stars of the show from my visits are the home made sauces. Sweet, hot and mustard versions all have a mix of smoky bbq, sweet tang and heat of mustard and chilli. I’m told they may sell them, I’d certainly shell out for the mustard one. With a good beer menu and having downed a couple of Sierra Nevada’s I was content with my choice and I’d return at some point for my fill of meats washed down with plenty of that sauce. With the disappointing launch the team have taken some flak on social media but are seemingly taking on board the comments and responding well, it is all too easy for new restaurants to get defensive. They’ve still got some improvements to make with the core offering though to make it a really popular spot when competing with the likes of Annie’s. Apparently there’s another similar styled restaurant that opened up in the city centre that’s miles better than this – any ideas what it’s called? I think it’s down near delilahs and pit and pendulum.